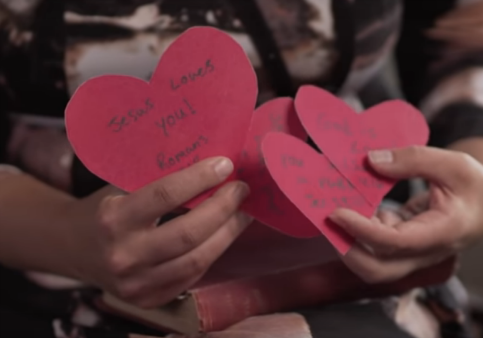 A newly filed lawsuit alleges a Wisconsin community college violated the First Amendment rights of one of its students when it prevented her from handing out religious-themed Valentine's Day cards earlier this year. The suit, filed last week in federal court, was brought by the Wisconsin Institute for Law & Liberty (WILL) on behalf of Polly Olsen, a paralegal studies student at North Eastern Wisconsin Technical College (NWTC). WILL claims NWTC infringed on Olsen's First Amendment rights by not only preventing her from handing out Valentine's Day cards with biblical quotes inscribed, but also by limiting free speech to a fraction of its campus. NWTC's public assembly policy designates an area outside of the college's main entrance—constituting less than 0.5 percent of the overall campus—where students are allowed to express themselves. Furthermore, the college requires individuals to request approval before being allowed to use the space. The policy "is not intended to limit or discourage the free exchange of ideas." Rather its aim is to facilitate such an "exchange" without having it "interfere with the education of students and the College’s work." The defendants listed in the suit are NWTC, its district governing board, and five of the college's employees, including its president and head of security. At the center of the case are the events that took place on Feb. 14, 2018. Olsen told the Washington Free Beacon that on the Valentine's Day in question, much like in previous years since 2009, she went to NWTC with the intention of handing out cards to friends and colleagues alike. "Within 15 minutes of being on campus, I was stopped by security and told what I was doing was against NWTC policy," Olsen said. "They said I was ‘soliciting.'" Upon being escorted to NWTC's security office, Olsen was again told her actions constituted "soliciting" and were in violation of the school's public assembly policy. A report filed by the school's security coordinator in response to the incident indicated they became involved in the matter after an anonymous call was placed. The caller, who has not been identified, complained of a female student "handing out Valentine's Day cards with Bible references" in the area around the General Studies Office, a section of the NWTC's student center. NWTC's security report also denoted Olsen was informed "some people may . . . find the message written on the card[s] offensive." According to Olsen, her cards were inscribed with biblical quotes like: "You are special! 1 John 4:11," "God is love 1 John 4:11," "Jesus loves you! Romans 5:8," and "You are loved and cared for! 1 Peter 5:7." Olsen and WILL dispute that her actions could be construed as "soliciting" since she was not selling the cards or requesting anything "on the part" of those accepting. As noted in the suit, Olsen had handed out similar cards in the past, and individuals were free to decline them on their own volition. WILL's lawyers say Olsen was not in violation of NWTC's public assembly policy as the cards were not handed out during class time, in the vicinity of the library, or in any "area where students were in a learning environment." They contend by isolating speech and expression to a small fraction of the campus and requiring prior approval, without an established criteria for what warrants approval or rejection, NWTC has infringed upon the First Amendment rights of its students. WILL also plans to argue NWTC's reaction to Olsen was discriminatory and motivated by the religious content of her cards. Shortly after the lawsuit was filed, the school released a statement by Karen Smits, NWTC's vice president of college advancement, defending its decision to prevent Olsen from handing out her cards on Valentine's Day. Smits asserted NWTC's policy governing public assemblies was in line with the U.S. Constitution and federal guidelines governing speech on college campuses. "The Public Assembly Policy establishes space at NWTC where picketing and mass distribution of literature can occur freely without interfering with students and the business operation of the College. This does not limit what participants can say or distribute (within legal limits)," Smits said. "The law recognizes that, unlike a public park, not all physical areas of educational institutions can be open for public assembly." Expressing that "religious beliefs were not relevant" to the incident, Smits claimed Olsen was stopped by security for being in an area of campus where "confidential records" are handled and public access is restricted. "Permission and a valid business purpose are needed for anyone to enter certain areas of the college that handle confidential records," Smits said. "When the student was stopped by Security (responding to a call), she was in one of these areas without a business purpose, as described in the incident report attached to the suit." The administrator argued NWTC's security was attempting to protect the privacy of its students and Olsen's presence in that area of the building for any reason would have resulted in a similar course of action. "The student was stopped by Security in an area that is not for the public," Smits said. "Had she been holding anything else—or nothing—she would still have prompted a call to Security … We take student concerns about free speech seriously and we take our legal responsibility to protect student records seriously as well." NWTC did not return requests for comment on this story. WILL and Olsen are pushing back on NWTC's interpretation of events and the reason for preventing Olsen from dispensing her cards on campus. Olsen disclosed to the Free Beacon she had been in the General Studies Office before, as she has two friends who work there, without any issues. "I’ve been in that office, in and out for personal and school business, for the past seven years," Olsen said. "I wasn’t stopped in the past." In its suit, WILL further elaborated the area of campus in question where NWTC claims Olsen entered "contained no signage or other indication of restricted access." When asked to discuss what she hoped to achieve with the lawsuit, Olsen expressed to the Free Beacon her hope that her story and experience would serve to educate students about their constitutional rights on campus. "Freedom on campus, freedom without freedom of speech isn’t conducive to education," Olsen said. "I hope to get the message out there on what our rights are as students, as Americans." "I love my school, but I love my freedom and God more," she added. This entry was posted in Issues and tagged College Campuses, Constitution, First Amendment, Religious Freedom, Wisconsin. Bookmark the permalink.